Daz takes great pleasure in making people happy through his food. 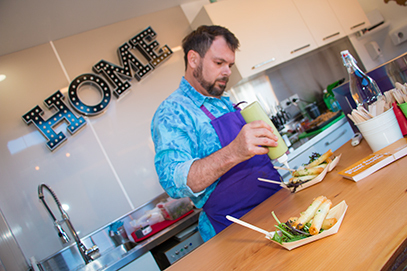 Daz the Chef has brought his culinary style 'Home' after cooking privately for High Net Worth families around the world both on their yachts and in their homes. Whilst working for families from several different nationalities he took great pleasure in cooking authentic local dishes and meeting the high standards that were expected of him as a Private Chef. The constant requirement to always provide fresh and new cuisines was always a challenge he relished. Having also travelled extensively and having an appetite to absorb the flavours and colours of each destination Daz’s eclectic range of styles was a great help to always creating something new. The same can be when he established his brand 'HOME' in 2015 which constantly evolved and garnered inspiration from latest trends and local flavours as well as international colours and tastes. His love for the exotic flavours from the Middle East, Asia and the Caribbean are still the inspirations for his private catering menus..
His experience providing 5 star cooking for his wealthy clients has enabled him to develop his private dining for Cantabrians and rather than have a set menu he likes to develop a new and personal menu for each client based on their likes, varying adventurous palates and special themes. This also flows through into everyday catering requirements for businesses and private functions alike where the client gets a personally created menu based on local and international produce and seasonal concepts.